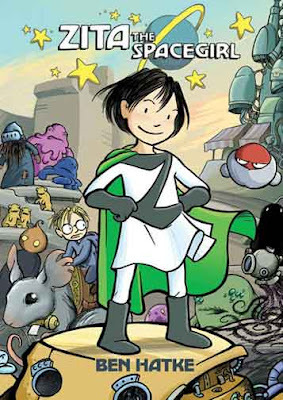 ZITA THE SPACEGIRL is the story of Zita and Joseph: friends and playmates. One day a meteoroid crashes near them. Inside they find a device that opens a portal to another world. Joseph gets abducted and Zita, after running from her problem, confronts the fear and goes after him, sparking an action/adventure/sci-fi story for all ages and genders. Perfectly balanced elementary graphic novel accessible to various reading levels, from below basic to advanced. I could barely contain myself the Friday night I read it. My wife, daughter and I sat in the living room with books in hand. It was one of our famous family reading nights. Unfortunately, I kept interrupting the sustained silent reading (SSR) time, shouting aloud how I could use this book to teach this or that or the other. “Sophie, you need to read this.” “This is a really good book.” “My kids are going to dig this.” “More inference.” “That would work well for so-and-so.” On and on I went. The two of them finally gave up on reading because of my constant blurting out. So, I get excited about comics and teaching. What can I say? Ben Hatke’s narrative approach reminds me of AMULET, while his art gives a good nod to AMELIA RULES –– both exceptional comics. The story is less intense than AMULET and not as intricate as AMELIA RULES, but neither of those observations are negatives. On the contrary, it is this less-than approach that makes the book more appealing to a wider audience and to the elementary teacher using it for an entire classroom. Do not mistake my “less-than” comment as a dumbing down of literature. ZITA does nothing of the kind. It is simply exciting and widely engaging. 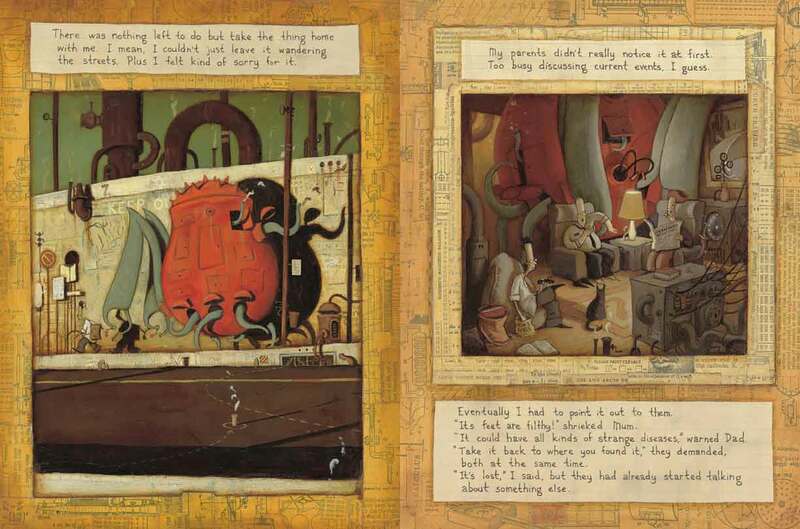 ZITA is the book –– the book –– I would use to introduce and teach inference to elementary students. After the students had extensive practice understanding inference, I would have them create their own comics (pencil-paper or online) that demonstrate an example of inference. I would then have the students read each other’s works. Then, and only then, would I move on to show students how inference occurs in traditional prose, again using an example from contemporary literature. The art on pages 56-57 details scientific descriptions of the creatures of the new world. This involved oodles of descriptive and high level scientific words. To look at this extensive list of vocabulary words, one might be tempted to save this comic for the highest of readers. I would consider that a mistake. 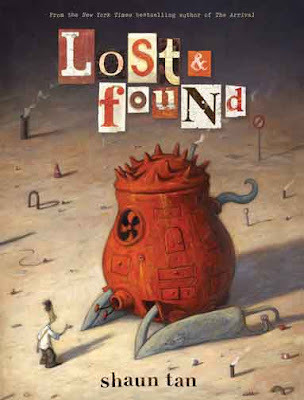 I would teach ZITA in class, and use it to help students practice their unfamiliar word strategies and learn how to make sense of the vocabulary words –– teach them not to be scared and help them discover a desire to find out what those words mean so they can connect more deeply with the story. Because the story is uncomplicated, it is a good book to teach students strategies and instill in them confidence in flushing out unfamiliar words and concepts. In short, ZITA is that perfect balance between authentic literature and teachable moments. It is not a classroom-created book, which often strips story over Lexile levels or vocabulary instruction. It is great literature that happens to be an excellent book to teach skills in real ways. Most of us know the tale of the explorers, Lewis and Clark, but in this graphic novel, Nick Bertozzi brings considerable skills of storytelling and graphic novel virtuoso to us into the famed exploration of America’s wilds. Bertozzi uses plenty of humor, setting and character development to show the reader how difficult the journey was, and also, how resourceful (and lucky) the two explorers and their crew were as it set out to map the lands of the Louisiana Purchase, as pulled off by President Thomas Jefferson. LEWIS AND CLARK is full of historical anecdotes and important dates, but we never lose site of the two main characters, later joined in story by Sacagawea, of course. It’s an adventurous tale, told here in graphic form. The black and white drawings by Bertozzi give a good sense of the landscape and open areas that were explored by Lewis and Clark, as well as the many dangers and predicaments the two were put into, along with their men. 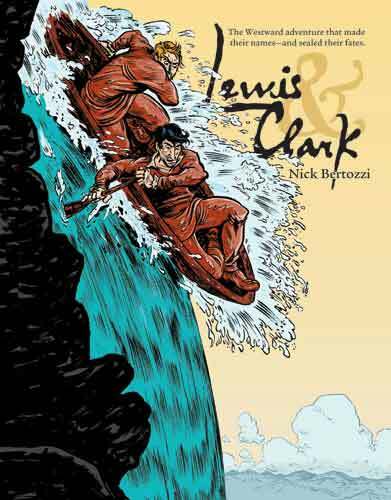 Bertozzi wisely uses the oversized pages to his benefit, stretching out frames to give the reader a wider angle or narrowing the frame to demonstrate danger or confinement. I have to admit, though, that I had a little trouble differentiating some of the characters at the start of the book, until I realized that Bertozzi had smartly given a shadow to Lewis’s nose (or, I think it is a shadow), which was a nice visual cue for me. Another use of visual cues is the font choices when different languages are spoken. Although translated for the reader, the writing styles indicate the difficulty of language barriers during the expedition. The study of explorers is a main element of most elementary school curriculums, and I’ll bet that some reluctant readers of a traditional biography format would eat up LEWIS AND CLARK, and gain a lot of knowledge about their work in doing so. This book is factual, as far as I can tell, useful and interesting. I highly recommend this book for any classroom, although I think it might have more learning relevance for elementary students or middle school students who may be studying the great explorers, such as Lewis and Clark. When I was a kid, I used to walk to the one-dollar movie theater in our town every weekend to catch the matinees, and one of my favorite movies was Sinbad the Sailor. THE SEVEN VOYAGES OF SINBAD is a version of those stories, and like the movie it seems a bit short on story. 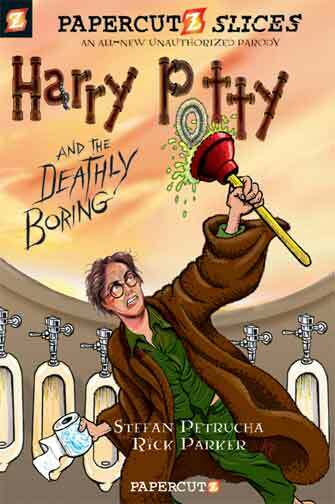 It occurred to me as I was reading this graphic novel that to cram seven stories into a single book might not have been such a great idea. We barely sink our teeth into one adventure when, suddenly, Sinbad finds a way to survive calamity and is off on another adventure. Of course, so much of the THE SEVEN VOYAGES OF SINBAD is stolen from The Odyssey, which is fine (heck, everyone steals from Homer). I just feel as if Sinbad deserves a larger canvas for his daring personality, his huge heart and his ability to withstand all sorts of danger. I guess you could view THE SEVEN VOYAGES OF SINBAD as an introduction to the character more than a definitive collection of stories. The artwork in this Stone Arch book is high quality, full of color and differentiated spreads that highlight monsters and the bravery of Sinbad on his seven adventures. One page stuck out for me. When Sinbad is trapped on an island of elephants and forced to consider killing one for its tusk, the elephant king looms large on the entire page, showing the size and power of the animal. This was very effective and is indicative of the art by Ferran. 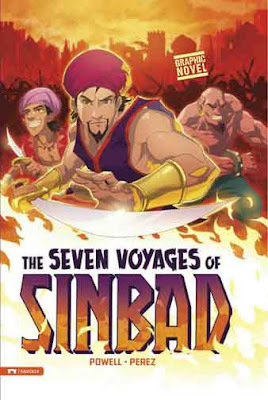 For readers who love adventure, THE SEVEN VOYAGES OF SINBAD is a nice addition to the classroom library in the elementary classroom. Stone Arch books again does a nice job of providing “extras” at the end of the novel, so that students can learn more about the Arabian Nights series of stories (this book is one of a collection of Arabian Night graphic novels) and real-world explorers such as Magellan and Ponce de Leon. A set of discussion questions and writing prompts is also a handy resource for teachers. I recommend SINBAD, but mostly for the entertainment value. I wish there was more depth to the stories and characters. THE SEVEN VOYAGES OF SINBAD could use a few more years at sea, so to speak. But it is appropriate for elementary and middle school classrooms. Rex Ganding teaches college-level English, from freshman to second year composition students. He has done so since Fall 2009. Just recently, Ganding has picked up a few graphic novels for his classroom (FAHRENHEIT 451, Y: THE LAST MAN Vol. 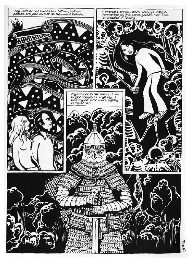 1, THE COMPLETE PERSEPOLIS, and UNDERSTANDING COMICS) and was kind enough to spare some of his time for a quick interview about his experience. EM: What did you want your students to achieve with the graphic novel that you didn't think you could do with a traditional text-based novel? RG: I have a few answers to this. I hope this makes sense. I'd like them to get a sense of who they are as learners. I also want them to recognize that we are living in a culture based on ‘screens’ and images. Learning to make sense out of images, verbally describe and analyze them, and create their own images is going to be critical for them whatever their field of study or career path. While being able to read and write traditional text is and will continue to be important, it is no longer the primary or the best way of conveying information. I think they need to be more aware of this, and I am taking the opportunity to raise and train that awareness in a college classroom. I think I'm able to engage more learning styles using a graphic novel. Because of the 'hybrid' form of reading that is required, I'm able to get more productive and efficient collaborative learning. Because of increased access to the Internet, television, iPhones, etc., I believe that a majority of my students are visual learners. Students who are more skilled at text-based reading bring their literary knowledge to the table. Non-native speakers of English also feel much more comfortable reading a graphic novel and participating. My objective to create deep analysis in discussion and writing is not as difficult as text-based work because the graphic novel is helping me tap into all these different modes of learning. Put simply, I am able draw on the variety of strengths in the classroom. Further, the graphic novel serves as a great way to negotiate what they bring as students and what I'm trying to accomplish as a writing teacher. 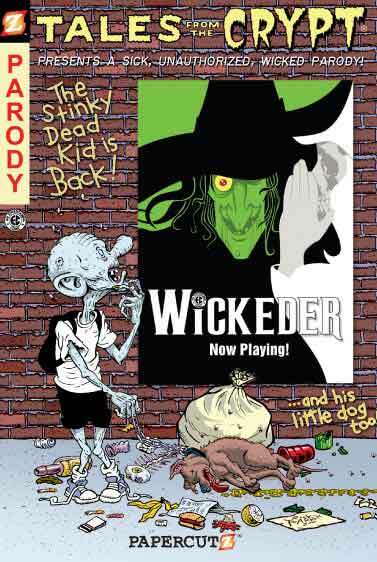 EM: What difference did you notice within your classroom when you used a graphic novel compared to a text-based novel? RG: During the past two semesters, I've brought in a graphic novel at different times during the semester. Last summer, I brought it in at the very beginning as the first text (FAHRENHEIT 451). I've never seen students as engaged in text as I did then. When going over the visual grammar that you helped me with using power point slides, the level of engagement was amazing. I think students really appreciate being introduced to a new way of looking at the medium. Using 451 early really set a tone for the rest of the semester and became even more rich when comparing to the original text. Since summer session is short, I had to build community, trust and a healthy learning environment in the classroom quickly. I think bringing in the graphic novel really helped facilitate that. This semester I brought in graphic novels at about the halfway point of the semester. From past semesters, I've come to learn that energy drops significantly at about that point. This not only happens to my students, but I feel it as well. Students have put in a lot of work at this point, and tend to start dragging. I wanted to bring in a text that broke structure, yet at the same time could be very productive to meet the objectives of the course. In my freshman comp courses, I feel that going through Y: THE LAST MAN has been refreshing for all. Again, trust has been re-established if not initially generated between the students and me. I'm hoping to ride that new energy to the end of the semester. EM: Speaking of Y, I’ve heard a few instructors mention that they had difficultly trying to use a graphic novel that had multiple volumes but it seems like you have a very focused way of looking at this particular graphic novel. GD: As far teaching Y: THE LAST MAN vol. 1, students loved it. Y was the completion of a unit on gender and language. We really spent time looking at the implied messages throughout the book. Further, Y serves as a nice transition into a mini-unit on communication and the language of images. After telling them we wouldn't read the next volumes, many ended up going out and buying some of the following volumes anyway. Seeing that happen was all worth it. EM: What are you most proud of, from either your students or yourself, that you've discovered with using the graphic novel? I'm proud that I've established a bond and common interest with my students. Last spring was the first time I picked up a graphic novel/comic since I was 11 years old. In preparing lessons (with your help of course) and working with students to make sense of these texts, I've not only rekindled an old hobby, but have also found a way generate a high level mode of discourse in a classroom. I've changed students' minds who were skeptical. As mentioned, I've had students buy the next volumes of Y. Another student brought in a comic book for me to read. One student went out and bought UNDERSTANDING COMICS. Student response has blown me away. EM: What advice or suggestions would you give to an instructor thinking about using a graphic novel for the first time in their classroom? What I told my graduate class yesterday was that if you ever need a pick-me-up, bring in a graphic novel. Seriously though, I would suggest either Will Eisner's COMICS AND SEQUENTIAL ART or McCloud's UNDERSTANDING COMICS to help ground lesson planning. Further, as you recommended to me, the “Political Cartoons Persuasive Techniques" have been great teaching PERSEPOLIS. I'm thinking of using AMERICAN BORN CHINESE next semester, and will use those techniques again. Finally, I would tell instructors to just go for it. I was a little nervous when I first used it, but once I saw the response, I really started to think of creative ways to use the medium in the classroom. 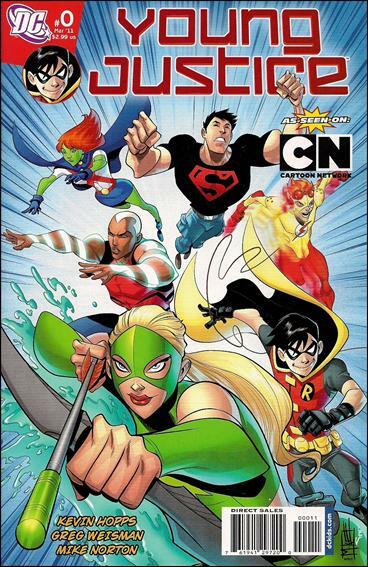 The YOUNG JUSTICE comic is based on the Cartoon Network animated show by Warner Bros. The kid supers –– Robin, Super Boy, Kid Flash and Aqua Lad –– are ready to join the forces of the big boy and girl superheroes, but Batman has not given the A-okay for them to be fully-fledged members. It’s driving them crazy. Most issues will feature stories by Greg Weisman and Kevin Hopps. The exception will be issues #1 - #6, which will be written by Art Baltazar and Franco (TINY TITANS and PATRICK THE WOLF BOY). The art will remain in the hands of Mike Norton (TEEN TITANS GO!). The comics will, according to various sources, be an extension of the cartoon not replicate it. For that, we thank you very much. I don’t typically review one issue of a comic because, frankly, it’s hard to tell much from a single issue. Something about YOUNG JUSTICE intrigued me. I purchased an electronic copy on my iPad and just sat down and read for a little while one Saturday afternoon. It’s plucky and full of adolescent emotion making it a teen target. The kid supers are teens but wish for more. Don’t they all? It was intriguing enough to make me want more. Not childish and not adult, YOUNG JUSTICE is an excellent superhero book for the middle school (or high school) classroom. The teens try to find themselves while simultaneously trying to carve out a place for their team with the adults –– a difficult task considering the enormous shadow that Superman, Batman, Wonder Woman, et. al cast. The art is very stylized and reminiscent of the animated show. Like the writing, the art is distinctly teen and very cool. Because of some mild language –– pissant for instance (which I always envisioned being spelled piss-ant until I looked the word up to make sure), and my suspicion that it might deal with more teen situations in the future, YOUNG JUSTICE might be best with two age recommendations: classroom (13+) and home (8+). For the classroom, I suspect ages 13 and older might be best in most cases. However, a teacher might choose to offer YOUNG JUSTICE as a Parent Permission Required book for younger kids. When it comes to home use, if my daughter were in elementary school, I would let her read it. Ultimately, it is all about community standards and school culture. The teens are not those of yesteryear. They are contemporary teens, which means students would be able to relate easily. There could be so many ways to incorporate YOUNG JUSTICE into the classroom: social skills, adolescence, the search for independence, bullies, anger, etc. Typical teenage problems. 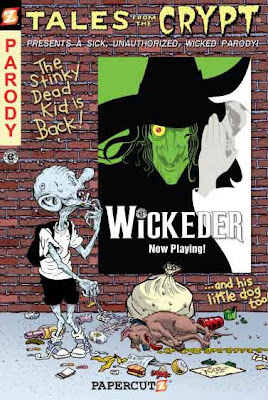 Two questions that my fellow teachers still ask me when it comes to teaching graphic novels are: Aren’t they just comic books? and What are graphic novels good at? ­The first question is easily answered in the traditional way—suggesting a quick read of MAUS. The second needs a bit more work, I think, and the answer isn’t necessarily a consensus, but I usually reply: graphic novels are most successful when they involve memoir or an unusually personal first person narrative. 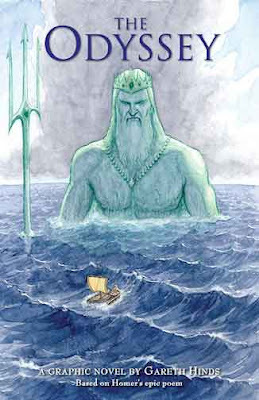 That’s not to say that graphic novels can’t do history or epics or even traditional genre material. Of course they do. But the graphic novels that excite me and suggest that the movement has a future are those that trace the personal journeys of idiosyncratic people engaging the world in novel and fascinating ways. I think of Alison Bechdel’s FUN HOME, Marjane Satrapi’s PERSEOPLIS series, and Josh Neufeld’s A FEW PERFECT HOURS. 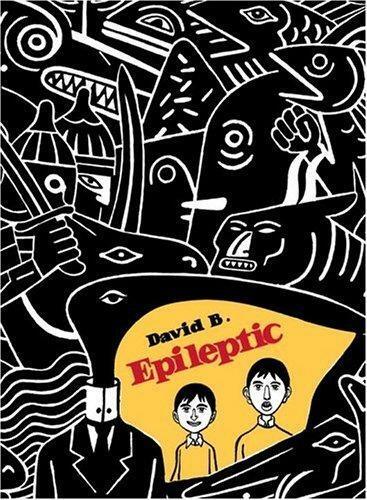 But before all of those came David B’s EPILEPTIC. Originally published in Paris from 1996-2004, EPILEPTIC chronicles the Beuchard family living in a small town near Orlean, France. At first the two boys—Pierre-Francois and Jean-Christophe—live lives packed with the minor dramas of childhood. They roam the streets in packs and harass lovers making out in cars. Before too long, however, Jean-Christophe suffers from devastating seizures. He falls into horrifying, drooling convulsions at the breakfast table and his brother, whose imagination is already set in overdrive, imagines his brother wavering between worlds, as if he is undecided between living in our dull, straight-edged world and the epileptic’s terrifying, but phantasmagoric one. His family tries everything to cure Jean-Christophe. They go through a parade of doctors who massage his feet, feed him macrobiotic foods, electrocute him, suggest experimental operations. There are also a series of gurus who suggest intense massage and acupuncture. Throughout it all, young Pierre-Francois’s relationship with his brother becomes more and more difficult. His love is twisted with fear and envy, disgust and grief. Pierre Francois retreats into his artistic world as a refuge from the ways in which his brother and life have disappointed him. David B’s art is the real treat here. Though there is a clear debt to R. Crumb, B’s art maintains an attitude of sweetness that leavens the ugly-on-purpose depiction of faces and bodies. There is also something here of Charles Burns’s black and white stark art and willingness to merge realistic art with surrealistic dreamscape freak-outs. I would even say there’s an element of mythic symbolism to his work; the spinning and cascading figures crowd both boys’ minds and jostle for prominence. While my first attempt at getting graphic novels into the door at my school would be a double shot of MAUS and PERSEPOLIS. My next trick would be to try and tie EPILEPTIC to another bildungsroman like A Portrait of an Artist as Young Man. An AP lit class or an accomplished Senior literature class could handle this with maybe a supplemental injection of Scott McCloud’s UNDERSTANDING COMICS. 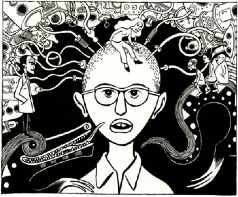 See New York Magazine’s excellent review of EPILEPTIC.